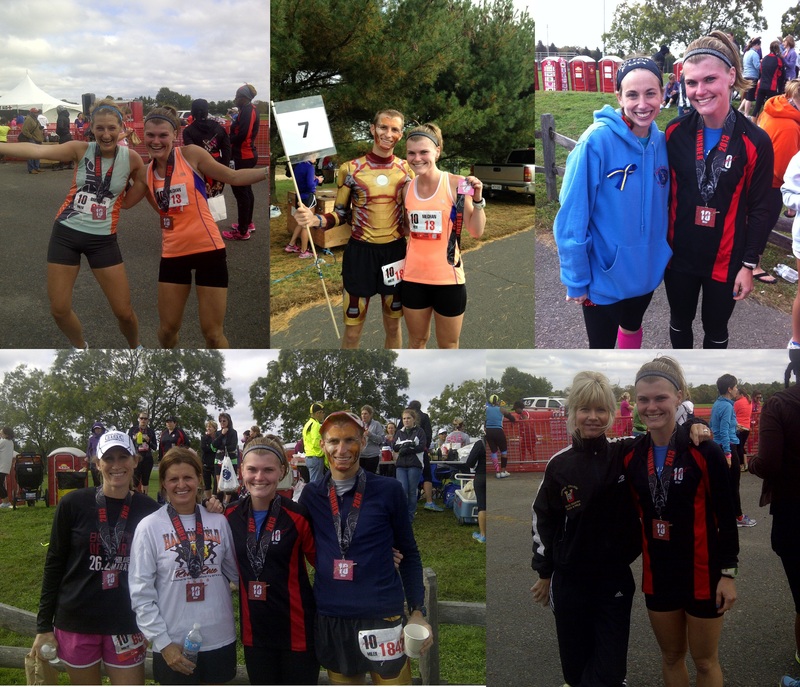 September 22 long run: I ran twelve miles as my long run this week, and had some good company. I mapped a somewhat engaging route, taking us down to the towpath, turning right, and continuing farther than I have been in quite some time. We got off the towpath a couple miles down, taking a road all the way out until it intersected with a common, hilly running route. All if this formed a big loop, with nothing repeated twice. It was a lovely, 64-degree sunny morning, and I could think of nothing else I’d rather be doing. The longest stretch of time during which I wasn’t talking was probably five or ten seconds, making this run certainly classified as “conversational.” It was a notable long run for me because of how the stats compared to this fact. Sometimes it’s not the races, or the speed workouts or tempos, but the ordinary runs that are the runs that boost us to a new level of confidence. I definitely could run Boston at that pace was the first thought that came to mind. Heck, I was talking the entire time. I wasn’t exactly well-prepared for the run, sleep-wise, or hydration-wise. But it was totally fine, and easy. And I averaged 7:36. So while 7:36 for 12 miles isn’t super fast by my standards, I still think it was my strongest “normal long run” to date given how I felt and the fact that I wasn’t concerned about my pace, and that made me happy. So did the Starbucks protein fruit smoothies we got immediately afterwards, after salivating over the thought of water and/or fruit juice the last two miles (little did I know, this smoothie would become a weekly tradition…). Note: This was my first run in my new North Face Better Than Naked Singlet, which took me way longer to buy than it should have. New favorite shirt – I’ve been digging TNF lately. September 24 PI workout: The workout two days after this was one I actually came up with: 2400-1600-1200-400-400 meters on the track. This was a good one because it started with a distance long enough to need to conserve some energy and find a good rhythm, then a “mile” because it’s always nice to have a mile split, a similar interval but a little faster, and then two much-faster laps. I ended up doing a third 400, and I’m not really sure why. I guess I felt I had more in me…and that wasn’t the best feeling post-last-400. I started it with some runners aiming to go slower, as their pacer of sorts, then decided to just speed up, why not. 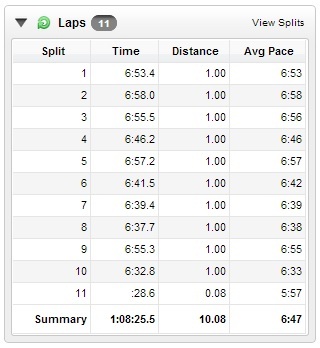 My splits were: 9:36 (6:24 pace), 6:14, 4:38, 1:24, 1:20, 1:23. 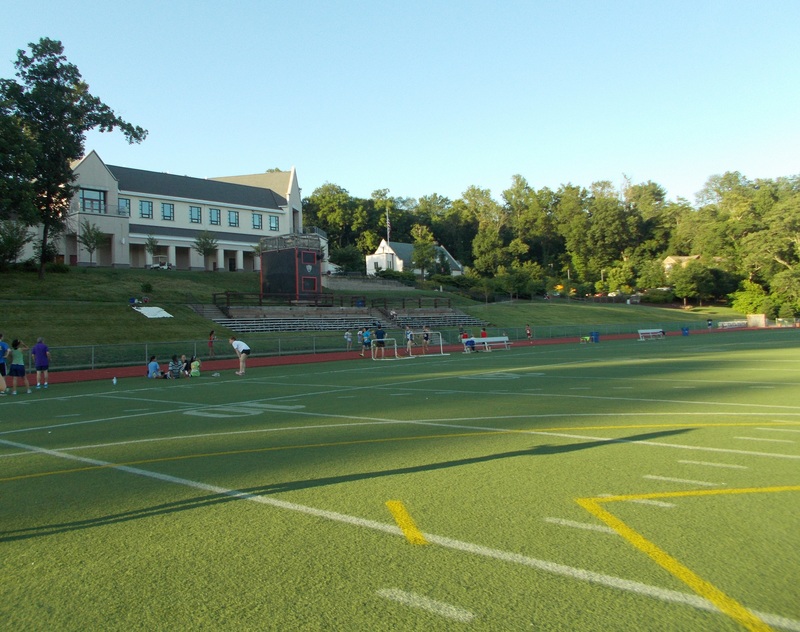 This is a pic of the track we’ve been using for workouts…this was taken during an all-comers meet in June, though, hence all the people and the warm sun…. 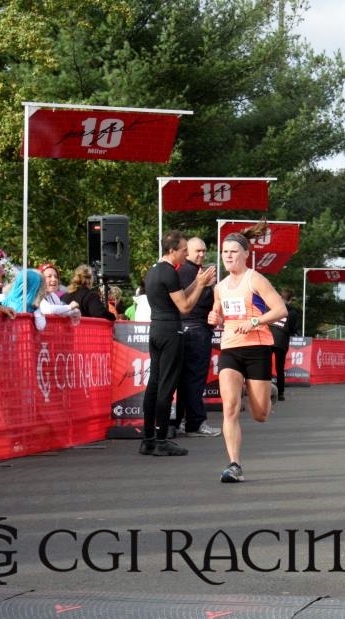 October 1 mile repeats: The first PI workout of this month was a bold one: 5 x mile. There was some debate over if it was 5 x 1600m or 5 x mile, so we (my sub-group anyway) ended up doing the first one as a full mile and the rest as 1600m. I was feeling pretty tired going into this due to the insane amount of time I spent in a car the weekend before, plus the draining Monday I had following that. I wasn’t really sure what my goal should be going into it, but I decided I would be happy if a.) I executed the workout better than I did in the spring, and b.) 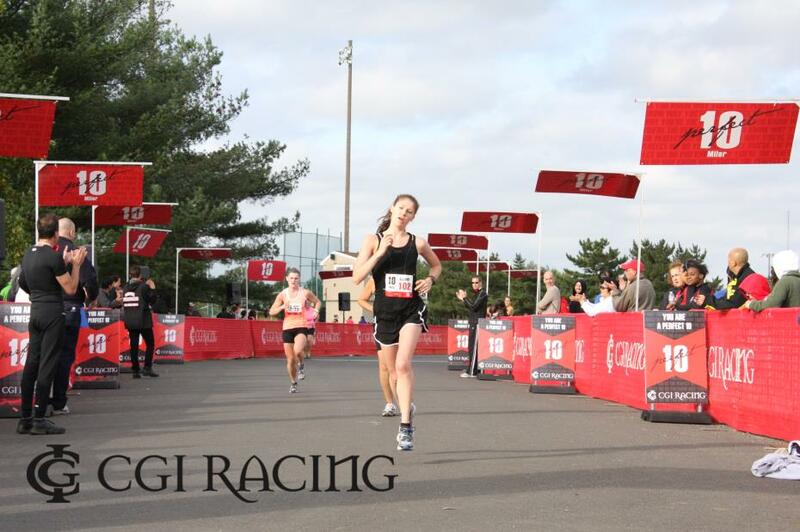 I averaged around 6:17 (ultimate goal 5k pace if I were to race one all-out right now, especially on a track). Note: 6:23 mile = ~6:21 1600. So, I averaged 6:19 in April and 6:16 in October. A small difference…but I did it in a much better way. This day for me also included a 1.94-mile warmup and cooldown to and from the track, at about 7:49 average pace, bringing my total mileage to almost 9. This is the kind of Tuesday I would like to have. While the easy miles aren’t necessarily quality miles, it does allow me to get them in, and I think feeling strong in the last mile or so (finished at 7:21 pace) of a cooldown post-hard workout does actually benefit you. I’m not sure if I can explain how excited I got without sounding crazy. Numbers just really excite me, okay? It doesn’t take much sometimes….13 is my favorite number – it’s my birthday day, when I used to play team sports back in the day I always insisted on being #13, it has been my house number once…AND it’s the year 2013, the race is on the 13th…I could go on and on. It’s like they knew I’d want it. Somebody did point out to me that it would be pretty cool if I was #10, since it’s the “Perfect 10.” But now two of us can feel lucky. One last thing – I am now cross-blogging for work on Run.com’s new WordPress site! 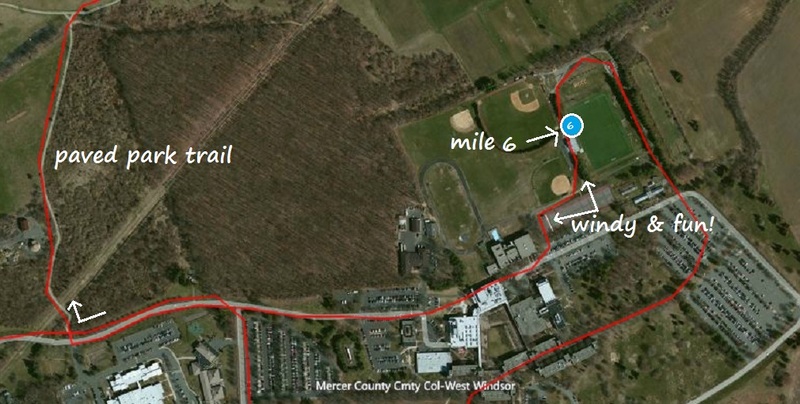 Chances are my posts on there will be less personal versions of what I write on here (like the course preview post, which is all I’ve done so far), but there will also likely be posts about more local events and running routes that will be useful to you if you are in the NJ area, so check it out from time to time! 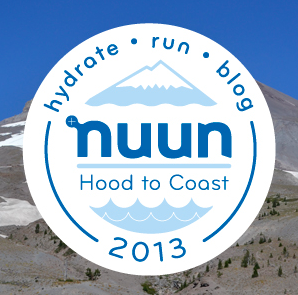 Perfect 10 Miler Course Preview: 1 week to go! I woke up to 100% humidity in both the air and, it seemed, in my head (nose, throat, etc.). Not an ideal combination (I think the roadtrip to GA, plus a busy week and hard running caught up with me). Ten miles of sweat would be a great way to flush it all out, but I was concerned I also wouldn’t be able to breathe. Oh well. It needed to be done. 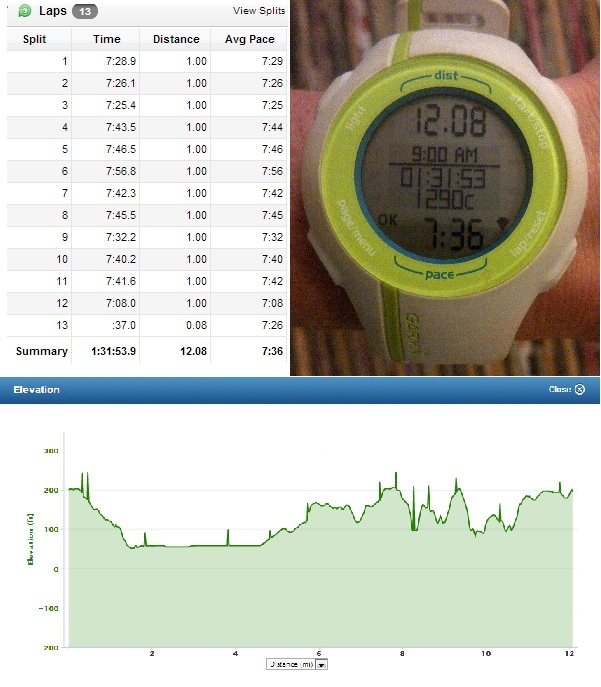 The plan was to run the first four miles at a normal, conversational pace, then bring it down to 7:00 pace (average goal race pace for the first half or so) for the next four miles, then run the last two easy and/or “normal.” And, of course, to learn the course. We had done a packaging-tape-laminating job to a miniature version of the course map to be pocketed during the run and referenced when necessary. 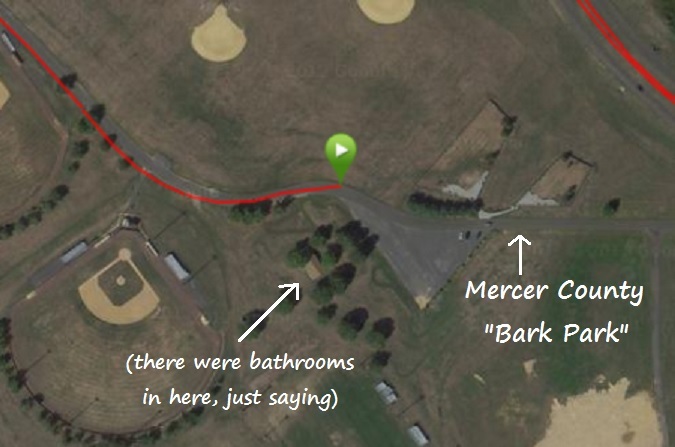 We imagined the start line to be precisely where the dog park parking lot narrows into a road, which leads to the main park road (Paxson Ave.), so that was where we began. The course turned right onto Paxson and did a u-turn onto the other side of the two one-way roads just before the park sign at the end (close to Old Trenton Rd.). The first mile was just after that. Mile two is on the same stretch, just before the Marina lot entrance. 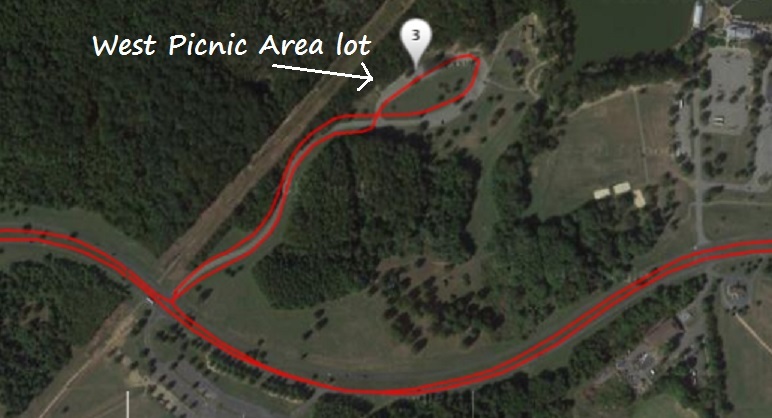 At the West Picnic Area entrance, the course takes a right. The surface changes here slightly, to rougher pavement, but not enough to make a difference. I just noticed. I usually park in this lot when I come here to run, so it was very familiar territory. There is a grass hill in the center of the parking lot – the lot loops around it. 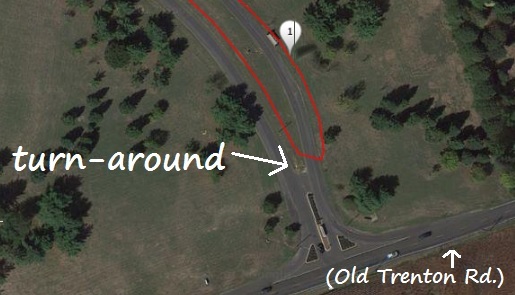 The course follows this loop and heads back out the same road, then makes a right back onto Paxson. 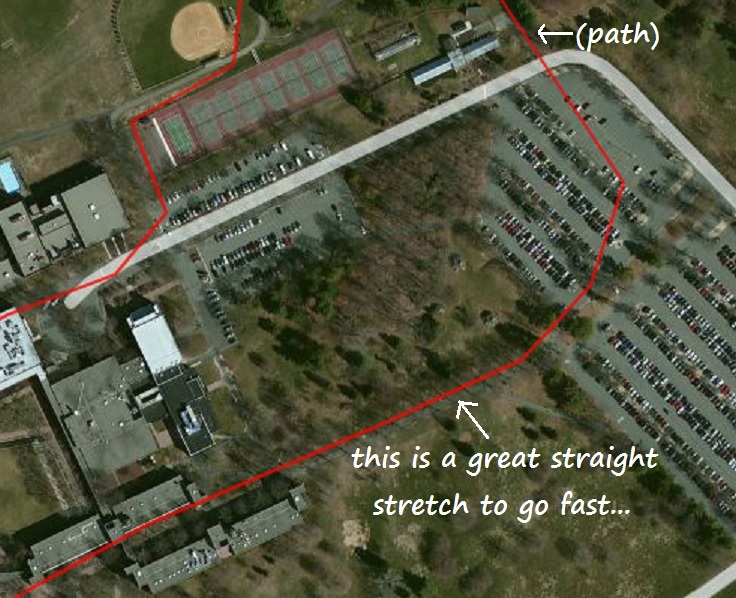 The third mile is on the far side of the parking lot, when you are about halfway across it. 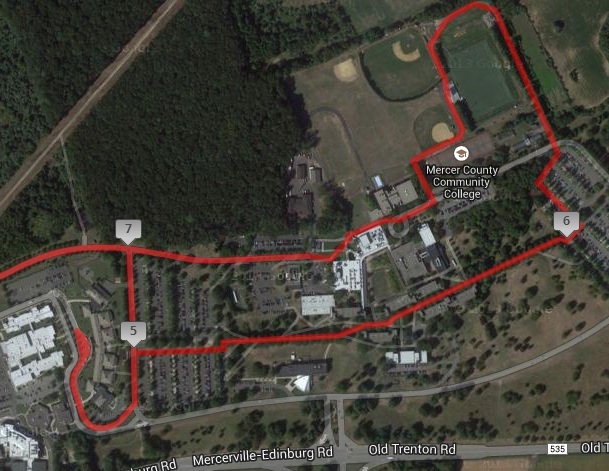 A note about elevation: this course only fluctuates by about 87 feet, which is nothing. There was a little downhill during mile three, which might get you excited for about ten seconds, until you realize it’s, um, already over. 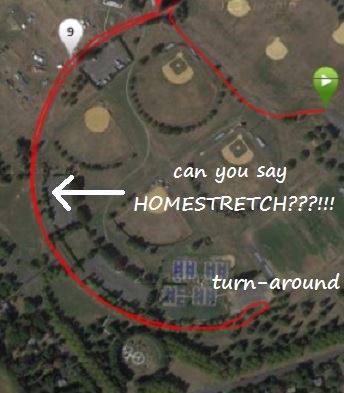 My watch hit 4.00 miles about 200 meters from Hughes Dr., where the course takes a left. I felt pretty decent for these miles, but I knew they would feel easier come next Sunday if I manage to kick this head cold (and I will). 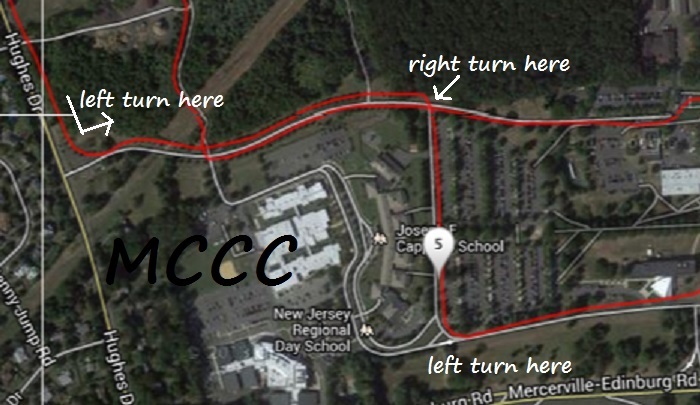 So, left onto Hughes and then the first (real, don’t turn onto the dirt road) left onto Mercer County College’s campus. 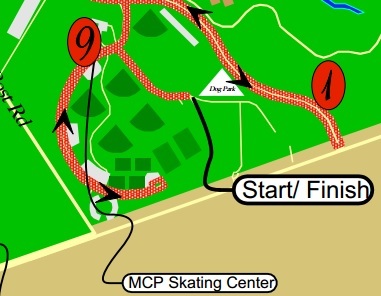 Then, the course takes the second right (the first right that makes sense) onto the road that circles the campus and initially borders a parking lot. The fifth mile comes up just before the road veers to the left. Then, the unexpected happens. The course makes a left…over the grass?! I’m going to call this a grassy knoll, because that’s totally what it is. It’s a very slight (emphasis on very) incline to get up and over the grass, and then you basically roll down the other side, over one walkway, and turn right onto a second, parallel walkway. 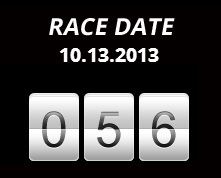 I’m sure on race day this will all be marked with cones or caution tape. I had no idea there was grass involved, but luckily my trusty pacer leader did (I’m not saying pacer – yet – because he ended up almost running out of my sight during these four faster miles!). Garmin’s path is a little wonky as usual, so look at the white arrows. Then, you basically blaze through the center of the campus between academic buildings on a wide brick path, which opens up to a wide sidewalk leading to another parking lot. There was apparently a walk for autism this morning, through which we ran through the middle…but they were putting away the clock so it was all good. The course turns left after passing two grass and tree medians and goes through the lot to meet up with another path by the athletic fields. I started to feel better around this point, as my watch hit 6.00 just before the softball field. This path is fairly narrow and windy, so it’s a good thing it isn’t in the first couple miles of the race. 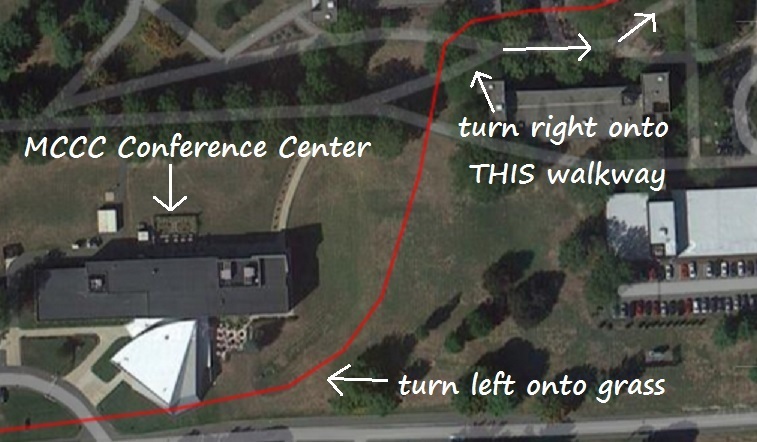 It spits you out right at the side of the Welcome Center, and then you get on the main road almost all the way to where you first entered the campus…but there is a sharp right onto a paved path that leads back to the park. This snuck up on me, and it kind of felt rebellious, like I was recklessly abandoning normalcy and heading for the hills (hey, why not make this description more fun?). The course just runs along the paved trail north until it intersects with the path that runs parallel to Paxson, where you make a right. 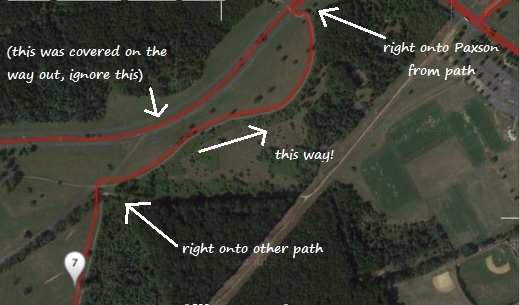 That path gradually curves toward Paxson, where it will intersect and the course makes a smooth right again. In general, the paths were fine; while some of them were windy (read: wind-y, not talking about weather here), I didn’t really feel like it made them “slow.” Footing was just as good as the road except for one small spot as you cross over the powerline overpass in mile six…there was a bit of sand/dirt (nothing to trip over though). The eighth mile ended on Paxson, so I slowed down to a recovery pace at that point, taking it pretty easy to get myself feeling back to conversational pace, but not stopping. …but if we were to make a right and head back to the spot where we started, it would put us at about 10.22 miles. So…is the course fairly long? Is the finish at the end of that road where we decided to stop? Is it somewhere in between? We’ll find out right away next weekend, when we see the “FINISH” banner positioned in its proper location. 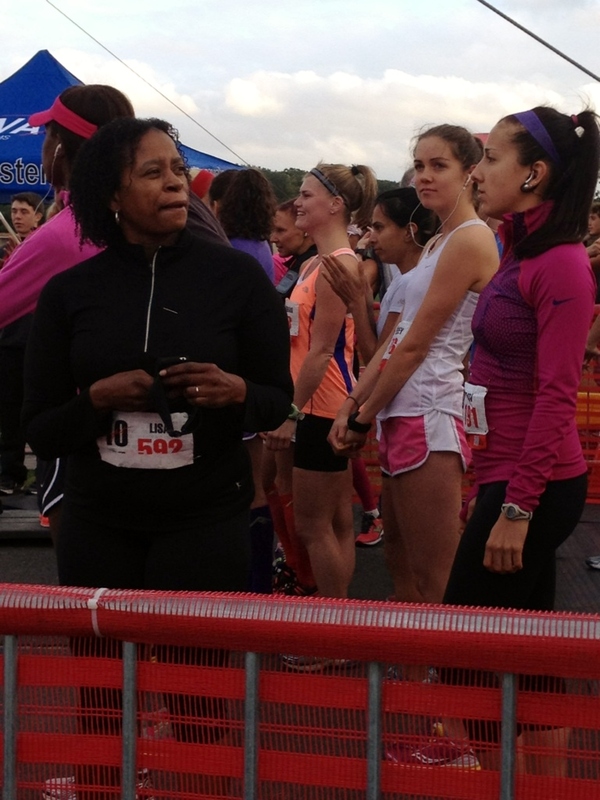 Perhaps I can shoot an email to the race director since we’ve met before; it’s a simple question. Yeah, that is 100% humidity. So don’t knock on me for looking like I jumped in Mercer Lake. I virtually did. Thoughts on the preview run…I’m very glad I did it. Specifically, I’m glad I didn’t decide not to do the uptempo portion because of feeling congested, or shorten it to three miles, which I could have easily done since I wasn’t sure whether to do three or four in the first place. I was glad I hit those miles in 7:00 or under, feeling like they were more like 7:05-7:10. The fact that the faster miles were also during the entirety of the technical part of the course is also advantageous; I have already ran through those sections at race pace, so next week I’ll know exactly where to go and what to expect next. Even writing this blog post (OMG it’s actually taken longer than any one – besides HTC – to date I think…) has helped me draft some racing/pacing strategies in my head! I was having a rough training week from Wednesday onwards this week (mostly because of feeling sick-ish, not really leg-wise), and since that hasn’t happened in awhile (yay! ), I was a bit discouraged about the race heading into this run. I’m learning,though, that I have reached the point where excuses aren’t options: barring rare, extreme unfortunate circumstances for legitimate reasons, I just run the pace I want to run because I said I would, I want to, and that’s that. It’s simple. 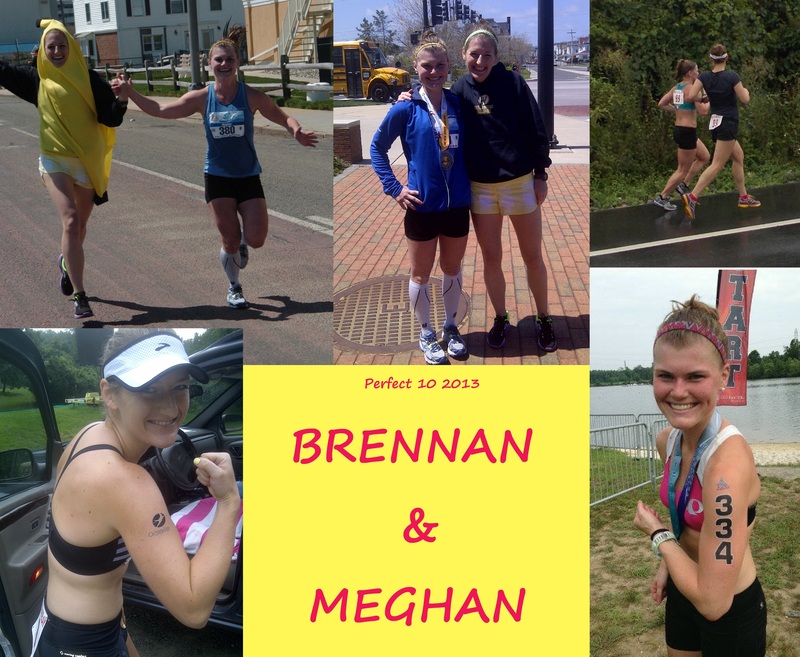 Author Meghan @ Shoe StoriesPosted on October 7, 2013 October 7, 2013 Tags long run, maps, Mercer County Park, Perfect 10 Miler, tempo, workout5 Comments on Perfect 10 Miler Course Preview: 1 week to go! 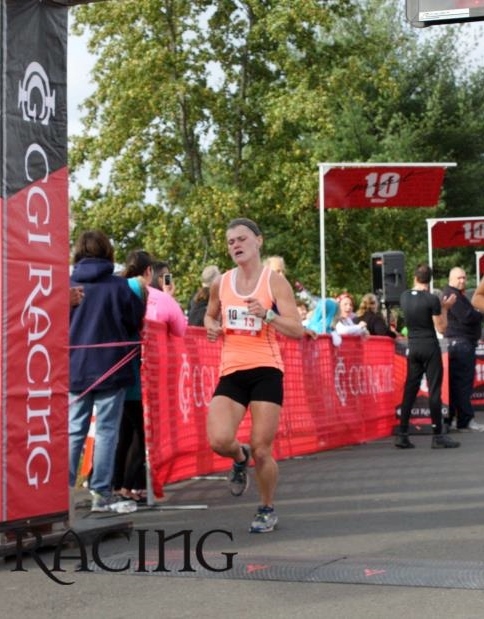 I wrote in a previous post that I am running the inaugural CGI Racing Perfect 10 Miler at Mercer County Park on October 13th. It’s going to be an awesome event, and I recently found out that there will be a “Pampering Party and Expo” the day before, in the park’s indoor hockey rink. The goal is to make it not an ordinary expo, with stimulation overload and samples being thrown into your face. Rather, it sounds as if it will be a shopping experience for women, complete with yoga classes and…a fashion show! It will also be open to the public. The event’s Facebook page is currently hosting a “model search” for the show, in which a pair of women who are running the race can submit a photo and a description of why they represent the event’s core values (and thus be a part of the show). …and if you haven’t registered yet, you can do that here. Don’t worry, I’ll be writing posts with more substance again very shortly…. 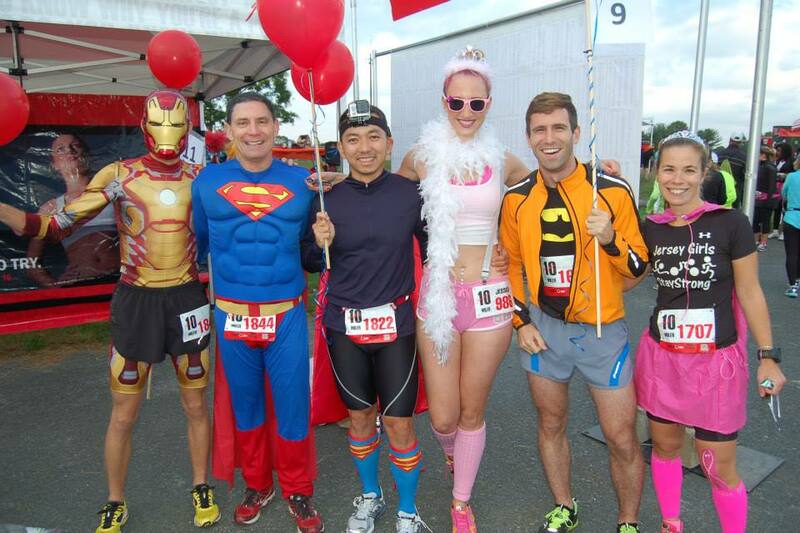 Run the Perfect 10 Miler with me October 13th! Well, I’ve written enough about me lately to last for awhile! Moving on. 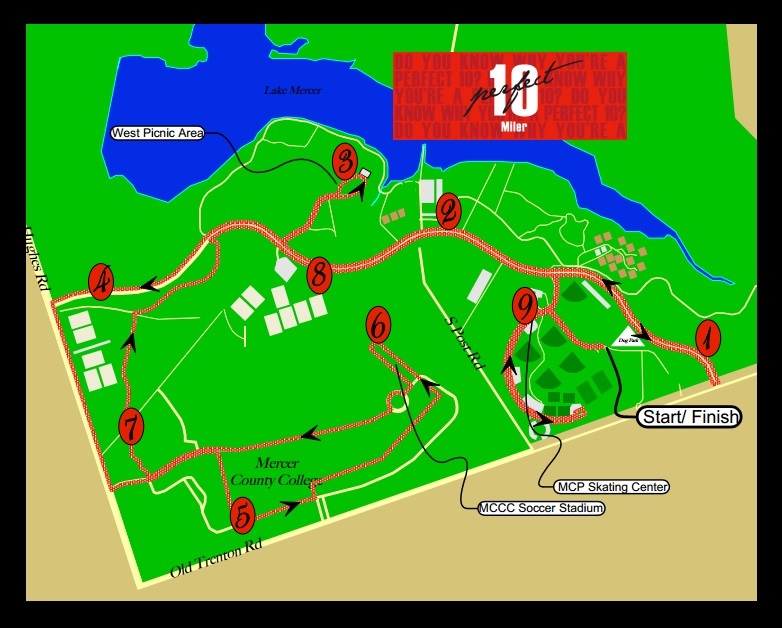 A few weeks ago, I heard about an inaugural women’s-only ten mile race at Mercer County Park in October, called the Perfect 10. It’s put on by CGI Racing, which also organizes the Rutgers Unite Half and the New Jersey State Triathlon, among other events. I contacted them about becoming an ambassador, and the deed was done! 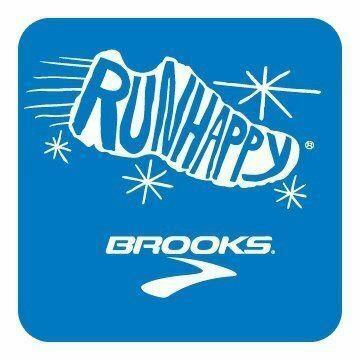 So, from now until race day (the 13th), I will be promoting the race on my blog and other social media outlets! I think it’s a great idea and a great park to use for it. Until the end of May, it’s $59, which is pretty good compared to half marathons and other area races around that time of year. Also, there will be a chocolate fountain at the finish – how can you say no to that?! The Perfect 10 race is an event that is not only a running competition but a celebration of our own positive image as women, both inside and out. 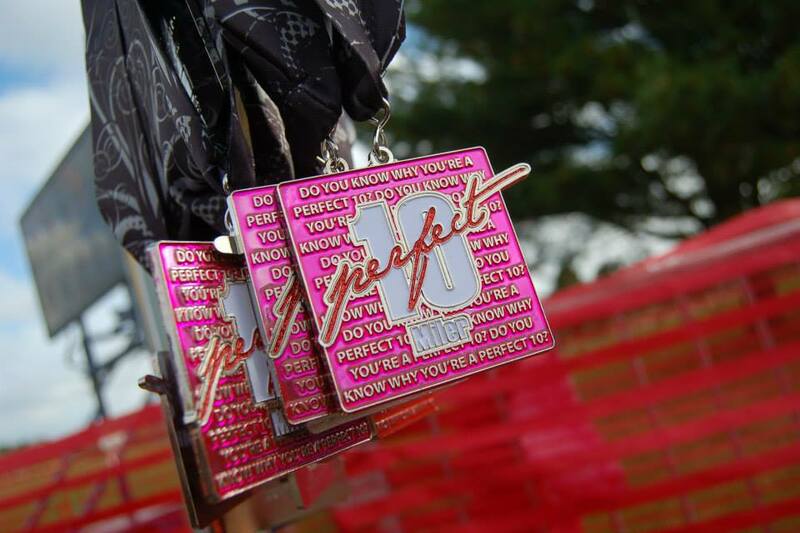 The organization encourages you to share your inspiring stories of why you are a perfect 10, and those featured monthly will have a chance to receive the Perfect 10 Honor on race weekend. 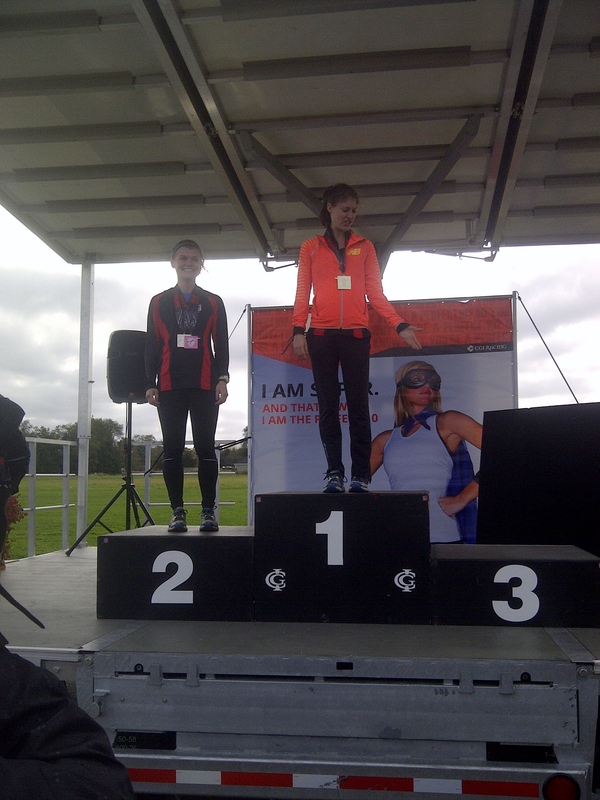 I remember reading a Runner’s World article by Kristin Armstrong once that really stuck in my mind. She wrote, “you are most beautiful when you are doing what you love.” That is a message I hope runners everywhere will understand, especially those who are self-conscious when taking their first strides outside the door. 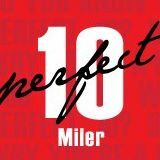 So, if you’re in the NJ/NY/PA/DE area and get excited about the prospect of a mid-fall ten mile race, chocolate, or men in tuxedos, please visit the Perfect 10 website to check it out further! Also, follow their Twitter and Facebook pages for the latest information and inspiration! 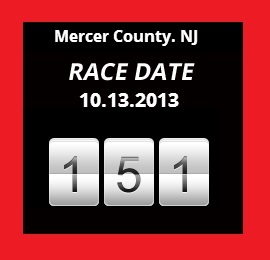 151 days until race day! 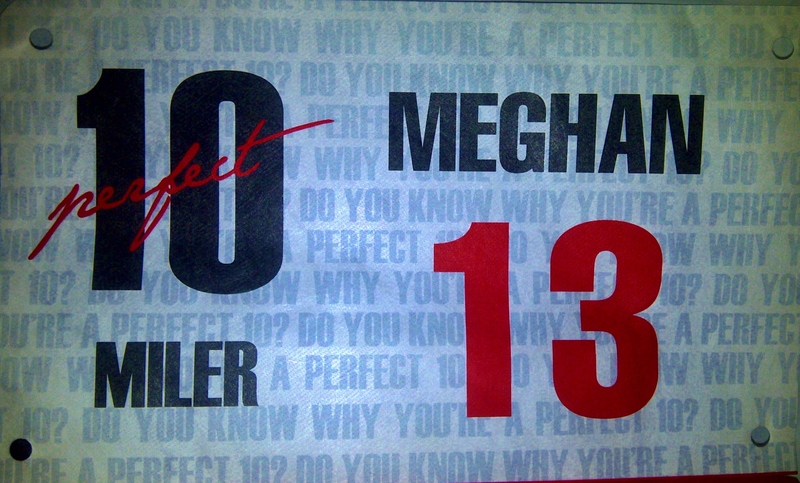 Author Meghan @ Shoe StoriesPosted on May 14, 2013 Tags CGI Racing, Perfect 10 Miler1 Comment on Run the Perfect 10 Miler with me October 13th!